Yiayia Katina Sykaras has a huge wealth of knowledge and the time to pass it on to her granddaughter Kate and grandson Stratis. Grandparents. Pappou and Yiayia! Sometimes we feel like they are angels sent from heaven and other times we feel like they’ve been put on this planet just to annoy us. Nevertheless, the special kind of love a child gets from a grandparent is a love they can’t get anywhere else. It is an important kind of love – very important in fact. In most parents’ minds, grandparents spoil their children. They are the ones who will constantly bend the rules by allowing their grandchildren to have everything. And by everything, we mean EVERYTHING. Biscuits, ice creams, lollies, arts and crafts, yummy food, homemade drinks and more. Much more. Quite frankly, the list is endless, although it can be narrowed down to one thing: Whatever it takes for the grandchildren to be happy. Do that! “From my professional experience with parent groups, a common issue that arises within Greek families is the grandparent issue,” says Greek Australian clinical psychologist Despina Pashalis, in an interview with Neos Kosmos. “While parents are more concerned with making sure that their child has eaten appropriately, slept on time, done their homework and has generally followed all the rules, grandparents will almost always ‘spoil’ the little ones, allowing their grandchild to do all those ‘naughty’ things they shouldn’t be doing,” Ms Pashalis explains. Psychologists describe this as ‘the warm and fuzzy’ grandparent feeling, which encourages young children to develop a strong and safe bond with their grandparents. Therefore, given that feelings of love and safety are the most fundamental needs we have as human beings, this special bond is what children benefit from in order to be able to grow into healthy adults. 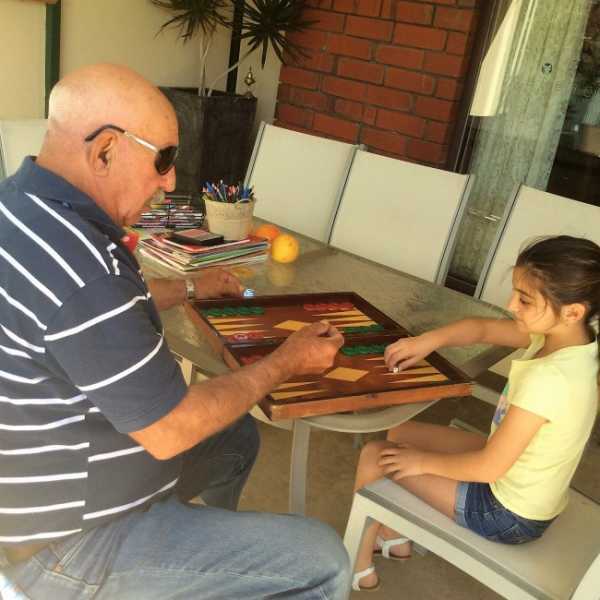 “Of course, our grandchildren are very special to us,” says 73-year-old pappou Dimitrios Kostomiris, who together with his wife Vasiliki are blessed with seven grandchildren. Pappou Dimitrios Kostomiris with his granddaughter. According to Ms Pashalis, grandparents are there to provide feelings of safety and connection, and this ingredient in itself is an immense benefit to a child’s social, emotional and intellectual development. “Even if boundaries are overstepped, it is done within a loving and safe environment. Think about how many times people complain about their parents while in therapy. Has anybody ever complained about their grandparents? The answer is no!” says the psychologist. When ‘in trouble’ with their children, grandparents have the best Greek saying at hand; “Του παιδιού μου το παιδί, είναι δυό φορές παιδί μου (“my child’s child is twice my child”). And no Greek parent to this date has ever been able to argue with that. “I didn’t truly understand what this meant until I had my first grandchild,” says 67-year-old yiayia Jenny Mavrogiorgis. “After having three children of my own I thought they had taken up all the room in my heart and didn’t think I could love anyone else as much, but when my first grandchild arrived, I experienced a love so great, a love double that of my children and realised what it means to have a grandchild in your life. It is just so precious,” says the yiayia of five, who is entirely committed to giving her grandchildren what she feels is the most important thing of all. Quality time. “One thing most people don’t always realise is that grandparents, grandmothers in particular, are very good listeners and they are much more than just a major provider of childcare for working parents. I enjoy spending quality time with the kids so I can get to know them, listen to their stories and secrets and help bring out their individual characters,” she says. 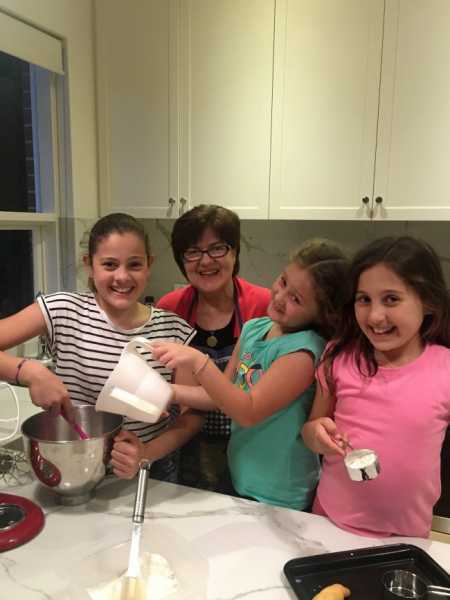 Yiayia Jenny Mavrogiorgis with her granddaughters having fun in the kitchen. Most of us associate the word ‘grandparent’ with yummy food, freedom and joy, as well as all of those warm feelings we need in order to develop into healthy adults, but the relationship goes much deeper than that. “A good yiayia gives unconditional love, makes the grandchild feel safe, comfortable and loved for who they are. Not for how well they perform in a test. In my opinion, a grandmother can be as effective as a teacher and in many ways coming to yiayia’s house is better than school,” continues yiayia Jenny. Greek-born childcare educator Eleni Tsegrenis compares the two. “I believe that what we give to children during their school years is very important, mainly because children are given the opportunity to be active and to interact with their peers. “Through forming strong friendships, children learn how to express their feelings, communicate their ideas and build their confidence. However, grandparents teach you the value of family and have the ability to give the sense of security and love in a way that no one else can. Children talk a lot with their grandparents, they talk about things that they often don’t even discuss with their parents and that’s what builds their social skills and helps encourage positive future behaviours,” Ms Tsegrenis tells Neos Kosmos. 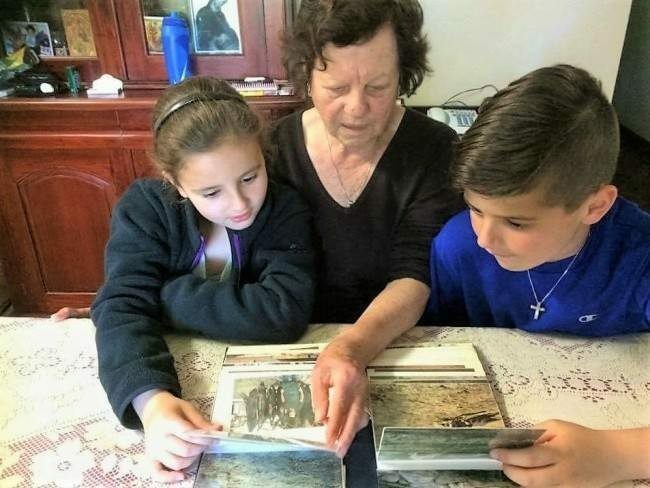 Seventy-five-year-old yiayia Vasiliki Kostomiris agrees that grandparents’ contribution to their grandchildren’s upbringing is crucial and that they are the connection between the children and the family history, culture and origin. “The love we have for our grandchildren is different to the love we have for our children. It was different when we were parents to our own kids. We worked hard and had little support. We are now the support that our family needs and in a position to give the children more of what the parents can’t. We close the gap that is there,” she says, and educators seem to also concur with this theory. “Grandparents often become surrogate parents due to their own children’s life circumstances and busy lifestyles. 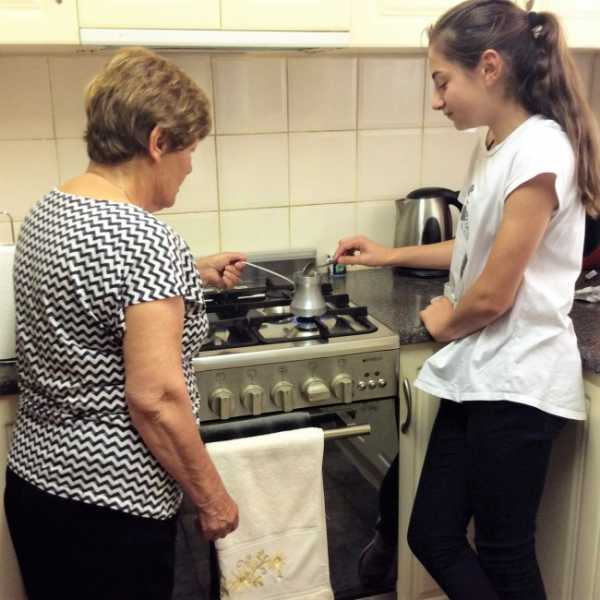 Yiayia Vasiliki Kostomiris teaching her granddaughter how to make Greek coffee. It is their wisdom and experience or even just the cooking or gardening experiences they share with the little ones that make children feel strong and proud. It’s about the way they tell a story, they hug and kiss and ultimately the way they say the most important words of all − I LOVE YOU,” continues Ms Tsegrenis. Growing up as a child whose parents had just migrated to Australia, mother of two boys herself, Ms Kathy Tellis, didn’t get the opportunity to meet her grandparents until she was nine years old. “When I finally got to meet them, the love and security they provided to me was as strong as that of my parents, except they spoilt us more. “Unfortunately I didn’t get to enjoy that on an ongoing basis and I always felt something was missing from my childhood. Therefore, when I had my own children, I craved for them to be surrounded by their grandparents’ unconditional love and learn more about family values,” says Ms Tellis. It seems that memories and knowledge grandparents share with their grandchildren gives them a sense of continuity and history that is important for their identity development, but one can’t help but wonder; is that how grandchildren feel? 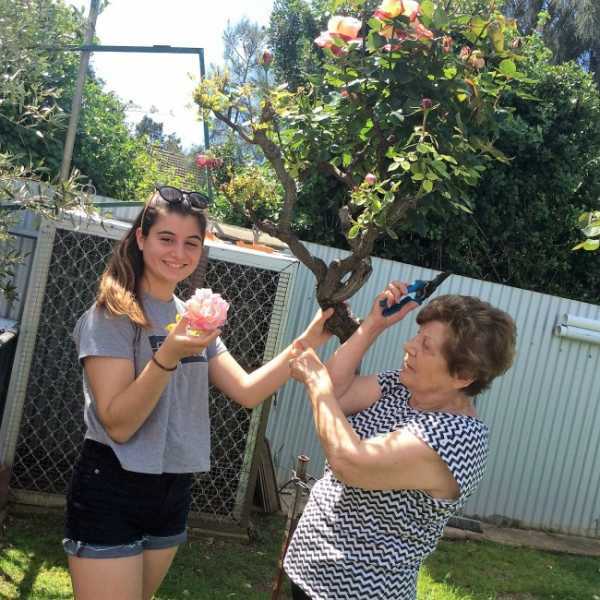 Now 14, Yiayia Vasiliki’s eldest granddaughter Victoria continues to crave and seek that connection while looking forward to “paying her grandparents back” in any way she can. “Pappou and yiayia understand the importance of family, teach us about their life back home which is essentially our history. They give to us a sense of tradition and culture and they provide guidance and life lessons which no school can provide. I know that my grandparents are always there for me and that their love is unconditional with no strings attached,” says Victoria. Yiayia Vasiliki with her granddaughter Victoria. Despina Pashalis explains that children have the ability to immediately feel the connection with their past because in their eyes, their grandparents are also a sense of ‘history’, both on a personal and a cultural level. At the same time, life is so fast and demanding that parents are not often able to spend quality time with their children in order to discuss personal and cultural values. “These values, customs and traditions are, more often than not, passed on from grandparents, especially in the Greek culture,” she explains. Victoria’s mum, Maria Paneras, wants her children to experience and immerse themselves into what she describes as a “piece of history”. “Without their grandparents the girls’ Greekness would be in trouble of fading. The grandparents give the girls a sense of Greek pride. When the children visit their grandparents they behave differently than they do at home. It’s almost like all three grandchildren step out of the daily chaos and enter into a Greek village. They help prepare and eat more Greek food, they speak more Greek, they listen to Greek music and they dance to it. They even watch Greek television. Sixty-nine-year-old proud pappou Elias Mavrogiorgis is a great example of that. 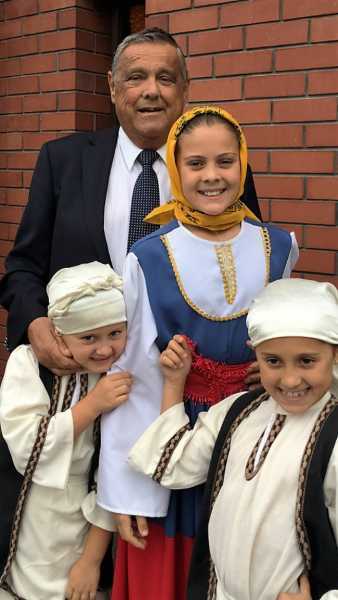 “My role in my grandchildren’s life is to teach them about our culture, our faith and our traditions and to become the conduit between them and their family history. Listening to stories of survival and resilience connects the kids with their heritage, gives them a sense of identity and the confidence to go through life’s journey,” he says. But it’s not only beneficial for the children to have grandparents around. Grandparents seem to also enjoy their once in a lifetime role; that of yiayia and pappou. “We certainly have a sense of pride when it comes to our grandchildren. I often tell people that my grandchildren are the most intelligent, most beautiful and the most loved children in the world. After all, that is what all grandfathers believe!” says pappou Elias. Pappou Elias Mavrogiorgis with his grandchildren. Ms Pashalis’ recent research thesis (December, 2015) also investigated the consequences of parental divorce in adults within Greece and how it affects the family unit. “Although western European research indicated that children of parental divorce are more likely to develop depression, cannot form relationships and academic achievement and career is affected, in comparison to children whose parents hadn’t divorced, our findings showed no difference, and no effects of parental divorce on children in Greece! And guess what? The majority of the children were being looked after by grandparents! “I think that says enough,” says Ms Pashalis, sending a clear message to parents who seek her advice on what to do with the ‘grandparent issue’. And by the sounds of things, they do it well.